My first taste of amlou, a classy nut butter, came at breakfast in the coastal city of Essaouira, Morocco. 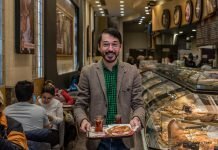 A vendor in the city’s ancient medina slathered the spread onto freshly cooked berghir, a yeasty semolina crepe that is cooked on just one side, forming bubbles on its upper surface. Swaddled in warm pancake, the nut butter oozed into the tiny holes left when the bubbles popped. The key ingredient in this Berber nut paste? Argan oil. 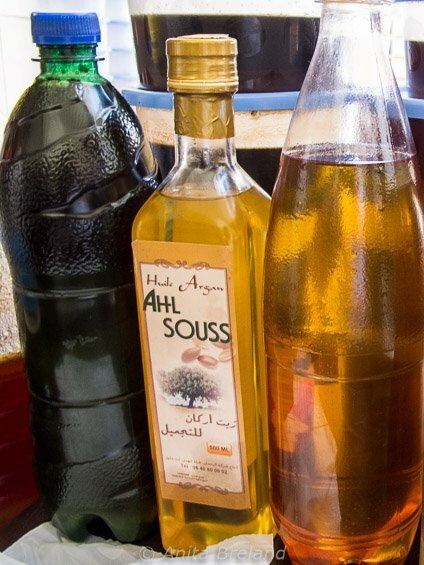 The oil’s flavor can be an acquired taste, but amlou turns many visitors to Morocco into converts. 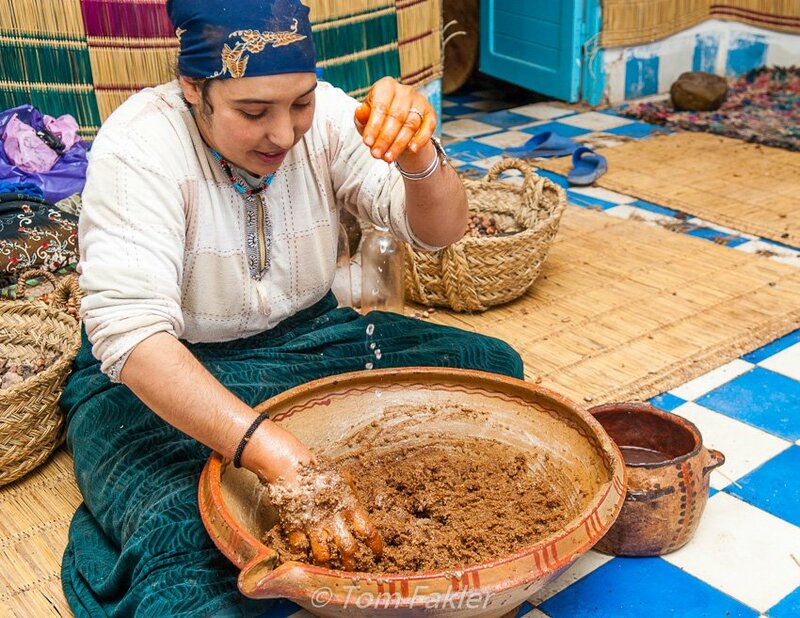 For centuries a mainstay in the Berber diet, the Moroccan culinary ‘gold that grows on trees‘ is a distinctive contribution to world cuisine. Its antioxidant properties are much prized by Berbers, and its rich flavor by leading chefs around the world. The golden-brown oil’s aroma hints of hazelnut and its nutty flavor expand on the tongue to a pumpkin seed-like toastiness, followed by a sharp finish. This goodness comes at a price, though: top-grade culinary argan oil without additives retails online for €20-15 per 100ml bottle. Added to milder oils, it enriches salad dressings, and in the classic amlou spread or as a finishing oil, the oil wears an antioxidant halo. From a flavor standpoint, argan oil works especially well in combination with seafood and citrus fruit. The healthful properties of the oil are lost when heated, so it is not for cooking. In the early 16th century, the Arab explorer and chronicler Hasan al-Wazan, called Leo Africanus in the West, reported tasting argan oil mixed into barley porridge, a traditional mark of hospitality that continues to the present day. Five hundred years after Africanus, Tom and I were welcomed into a rural Moroccan home with a platter of creamy rice, drizzled with argan oil glistening in amber swirls. Served at room temperature, this was Berber rice pudding, slightly sweet, the nutty oil deeply flavored. Not long after I first tasted amlou, I learned something of the hard-scrabble backstory behind argan oil on that visit to a remote farm in the Atlas Mountains. 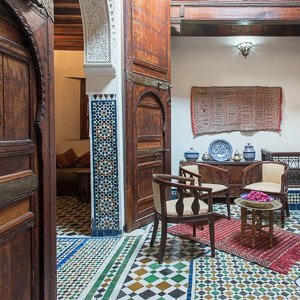 My host had adjusted her headscarf and settled onto the stone floor in her living room, a gunnysack of fire-roasted argan nuts at her side and a large stone between her feet. She showed me how to husk the nuts, bashing each one with a smaller stone, sending shells flying. Then, smiling shyly, she motioned for me to take my place on the floor beside her and handed me the small stone. It was hard going, and I clubbed my thumb and forefinger with every stroke. I got the picture: this oil is cussedly difficult to produce. For millennia, forests of argan, or Moroccan ironwood, covered much of North Africa and parts of southern Europe. With a lifespan approaching 200 years and able to put down roots that can reach 30 meters in search of water, the trees are a vital part of the ecosystem, helping keep the encroaching Sahara at bay. The argan forest has long been a primary source of forage, oil, timber, and fuel for Berber settlements. By the 1980s, though, charcoal-making and overgrazing by goats and camels, coupled with years of drought in the Souss river valley, had led to the destruction of much of the ancient forest cover. With more than one-third of the world’s argan trees gone in under a century and the Souss forest reduced to a skimpy 2 million acres, UNESCO in 1998 declared the tree endangered, and designated part of the forest an international Biosphere Reserve. 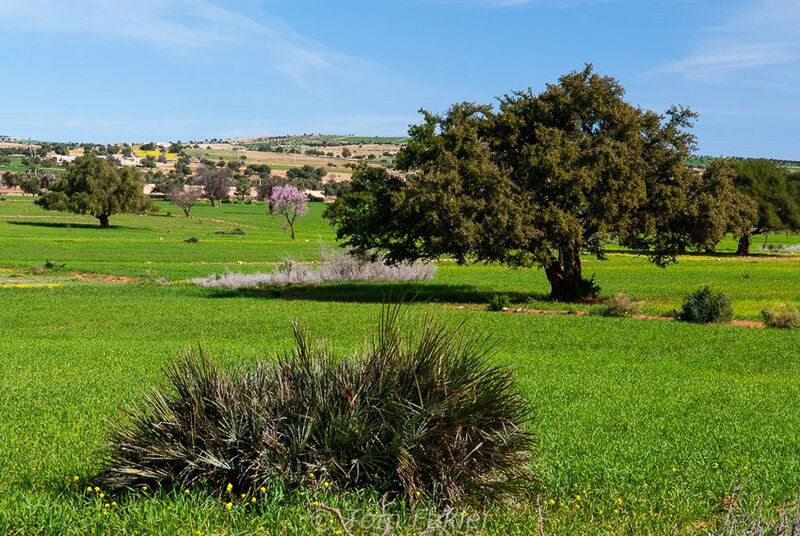 Today, argan trees are found naturally only in an area bounded north-south by Essaouira and Tiznit, and west-east by Agadir and the Anti-Atlas valleys south of Marrakesh. 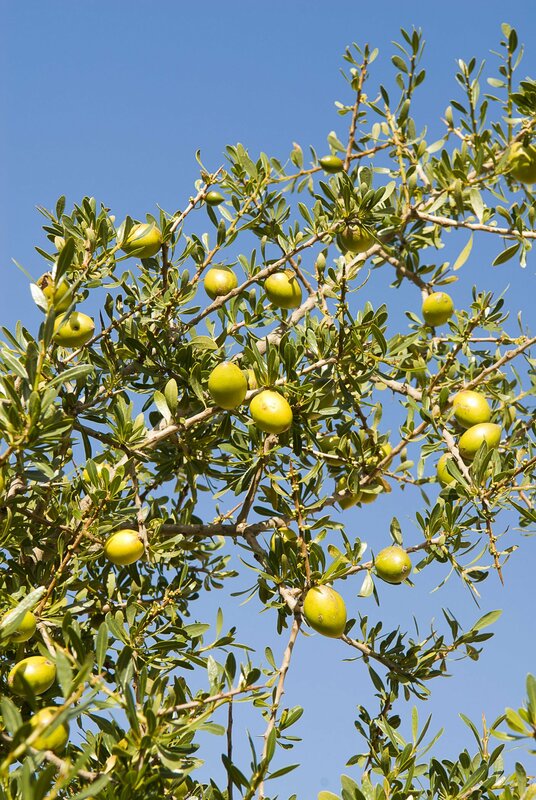 Argan trees can reach 30 feet in height, with gnarled trunks and branches that resemble thorny olive trees. 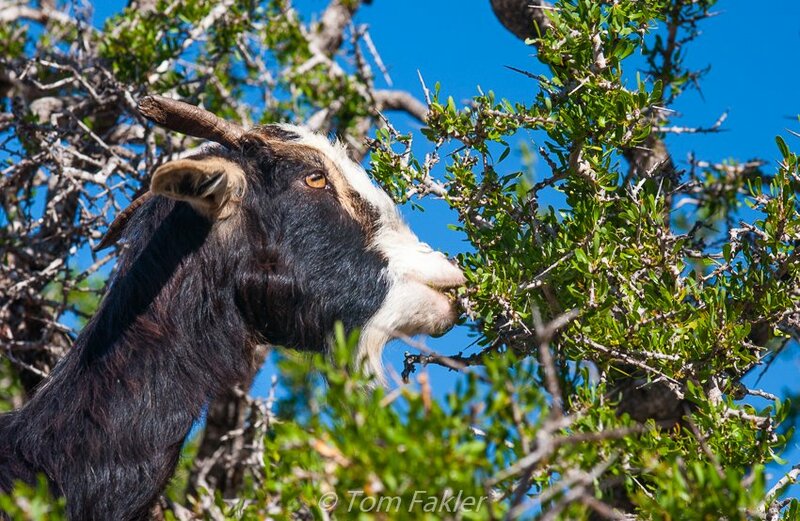 In an increasingly rare sight, goats clamber along the branches of argan trees, feeding on the leaves and fruit. When they eat the fruit, the fleshy part is digested but the nut remains. 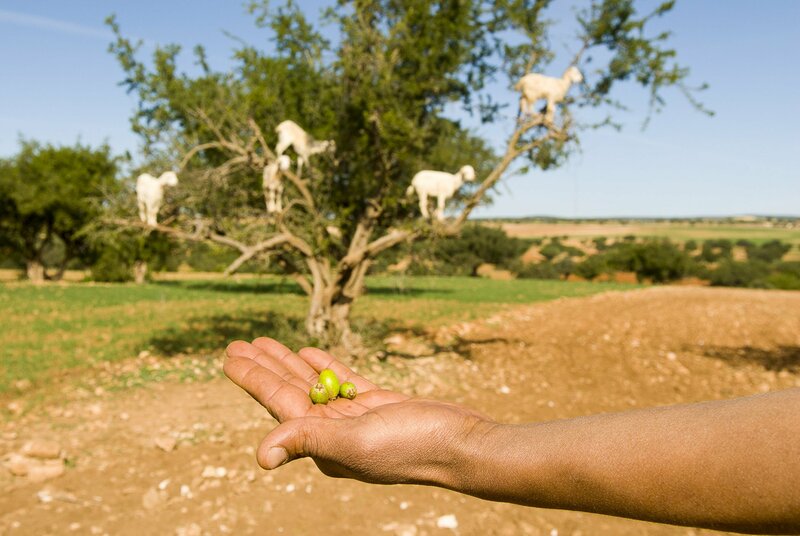 Edible oil is produced only from argan trees protected from the goats prior to harvest. 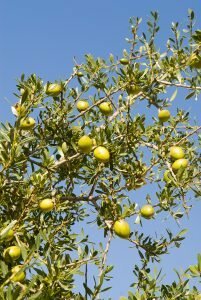 The argan nut’s exterior is green and fleshy, similar to an olive, but larger and rounder (it is actually a drupe, like an apricot or peach). The thick, bitter peel surrounds a sweet-smelling, unpleasantly flavored layer of pulp. This conceals an extremely hard nut, which in turn contains one to three oil-rich kernels. It’s the pulp that grazing camels and tree-climbing goats are after, and Berbers use it as animal fodder. The pulp conceals an extremely hard nut containing one to three oil-rich kernels. 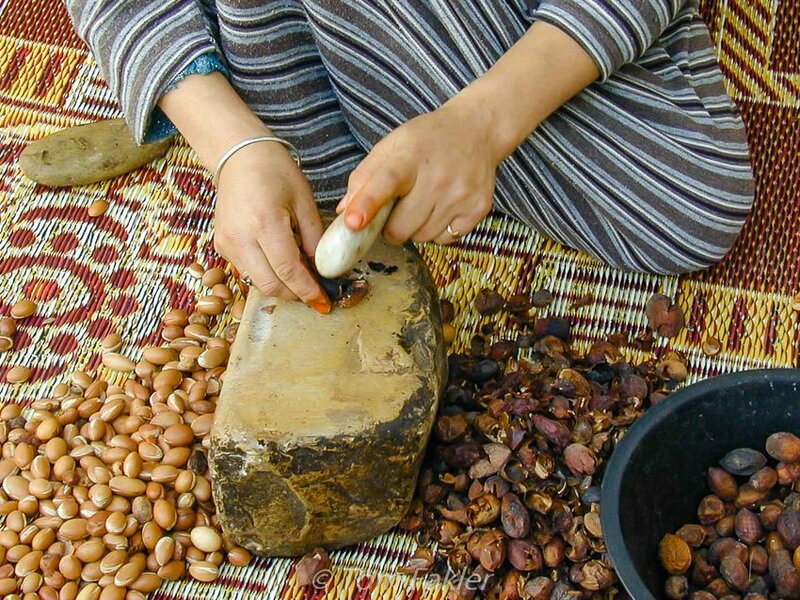 The most labor-intensive task in producing argan oil is, as I found out, cracking the hard nut manually between two stones. The kernels are air-dried, and those destined for culinary use are roasted over mild heat, which enhances the oil’s peppery flavor. Traditionally, the roasted kernels are then ground to a paste in a hefty stone quern, blended with warm water, then manually kneaded and filtered. This extraction method is still followed to produce oil for home use. It can take an experienced worker from 15 to 20 hours to accumulate the 2-1/2 kilograms (5-1/2 lb) of kernels needed to produce approximately one liter (26 fl oz) of oil. The argan kernels will be roasted over coals to bring out the nutty flavor. Roasted kernels are ground to a paste in a hefty stone quern, and blended with warm water. After grinding, the paste is manually kneaded and filtered. In 1999, Professor Zoubida Charrouf, a chemist at Rabat’s Mohamed V University, established Cooperative Amal (“hope”) in Tamanar. 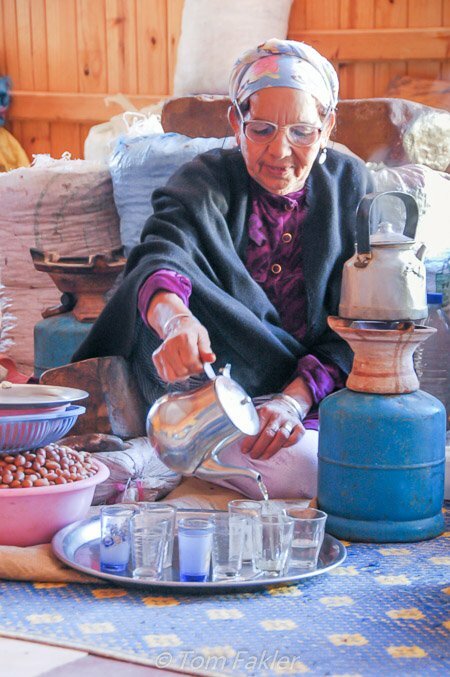 The venture was dedicated to argan oil production shared among Berber women. In 2001, Cooperative Amal received an award from the international Slow Food Association, for its promotion of traditional and ecologically sound production methods. 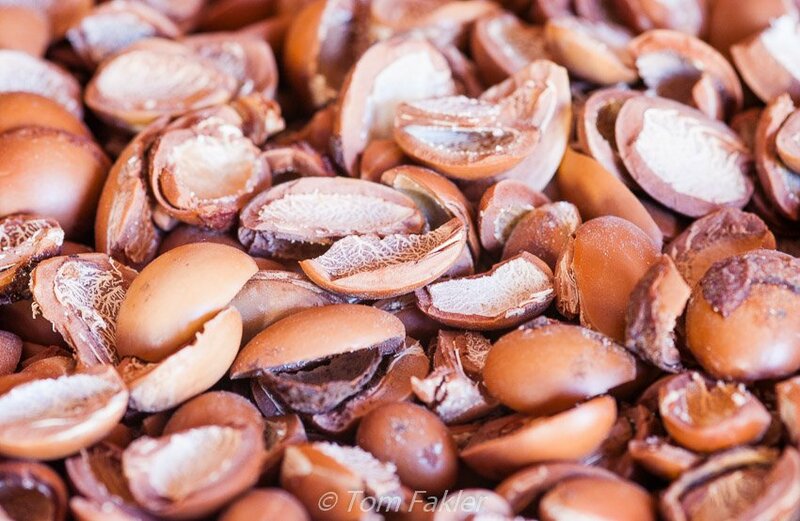 Oil produced in the traditional way keeps up to six months and unopened argan nuts can be stored for as long as 20 years. Rural families sell nuts from their silo ‘bank accounts’ when they need cash. Nowadays, mechanical grinding has mostly replaced the quern in commercial production. It shortens production time, does away with the need for filtering with water, and lengthens the shelf life of the bottled oil, to 18 months or more. 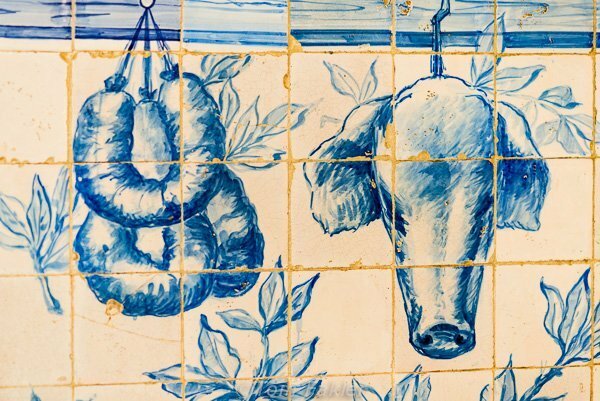 The flavor of the end product is also milder than oil produced by traditional methods. Amal (“hope”) and other cooperatives provide incomes for women and education for their children. Argan oil is readily available in Europe and North America, and can be ordered online—a seismic shift for an ingredient that until not so long ago was a secret of the Berber kitchen. No nut-bashing required! Have you tried Morocco’s Liquid Gold? What a fascinating process and background. I’ve only seen Argan oil in hair or skin products in the states. Love seeing the Berger women at work but hope that modernization hasn’t put them out of an income. Thanks for your comment, Elaine. 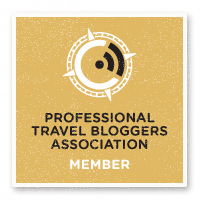 The process is indeed fascinating! 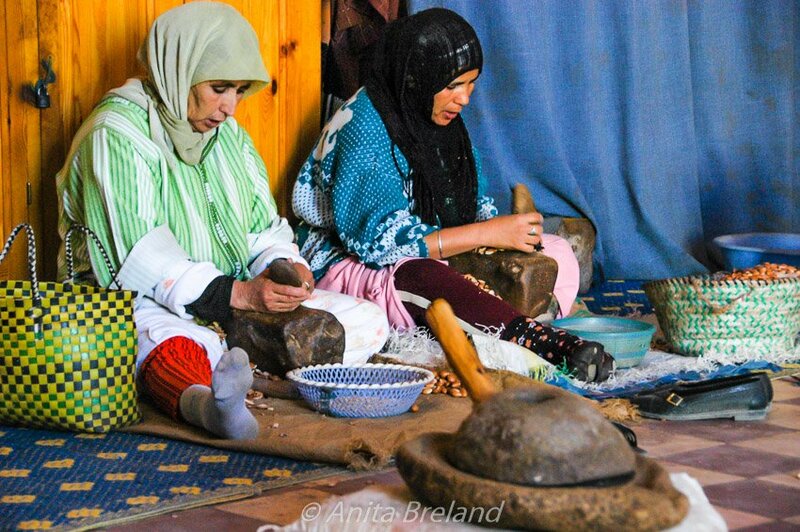 The Berber women we met were all working in cooperatives established precisely to provide them with income, and educate their children…inasfar as the argan trees themselves are protected, there is a future for the families supported by this cottage industry. 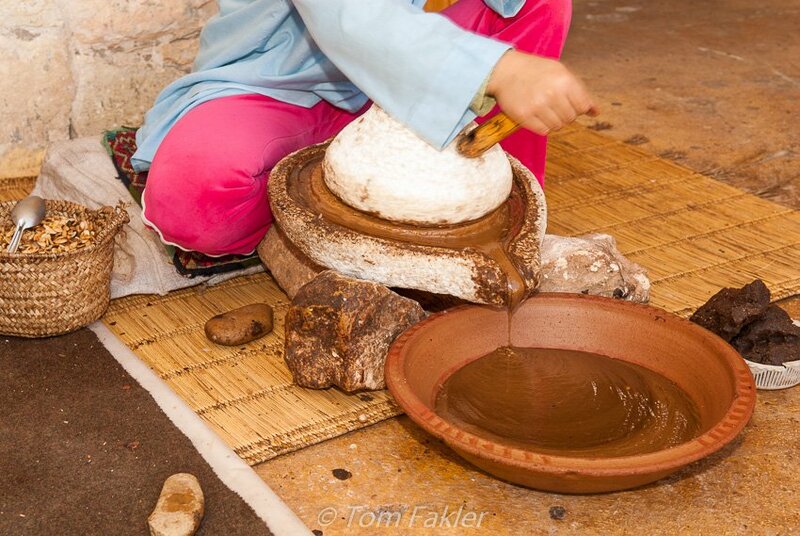 Most of the modernization is, as I understand it, focused on argan oil for cosmetic uses…hope so, anyway! How very interesting! 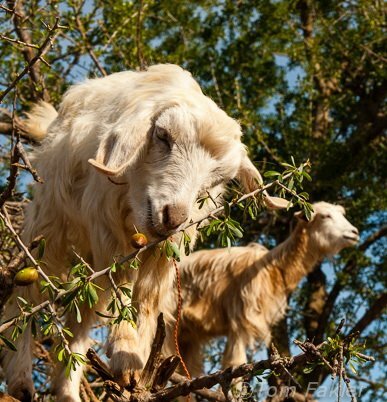 I love the pictures of the goats in the trees. I don’t believe I’ve tried argan oil I’ll be looking for it on the grocery store shelves. If you are looking for culinary argan oil, seek out labels that say 100% argan oil…no other ingredients! One reputable online source might be Food52. Wow all this time I’ve been putting argan oil in my hair not knowing there was actually a culinary oil. Now I’m curious to try it. Thanks for sharing this story. Ah yes, Natalie, they are two different products! The cosmetic oils are not roasted (which diminishes the goodies absorbed through skin and hair), and probably have all sorts of other components. The culinary stuff should be 100% argan oil, and bottled within the past year or so, to be assuredly fresh. Wow! What an informative and interesting post. Before reading this, I might not have recognized an argan nut if I saw one. I still might not but you can bet I’ll be on the lookout! 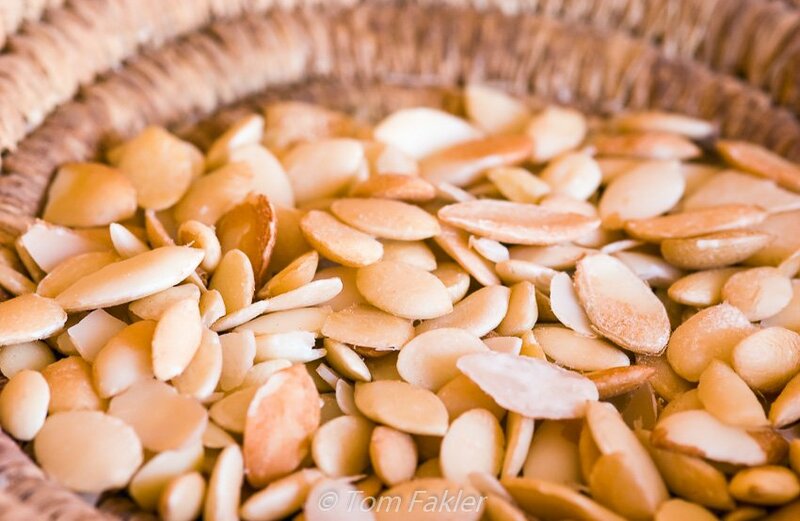 Argan oil (the culinary kind) can deliver on its promise of an ‘aha’ moment…the story behind the nuts fascinated me, but the oil itself is a culinary revelation! Argan oil is something totally new to us. Never heard of it before, but now we must try. Always love to learn about something new, especially food related, thanks! Argan oil is one of Morocco’s best take-aways, IMHO. Definitely worth a try! 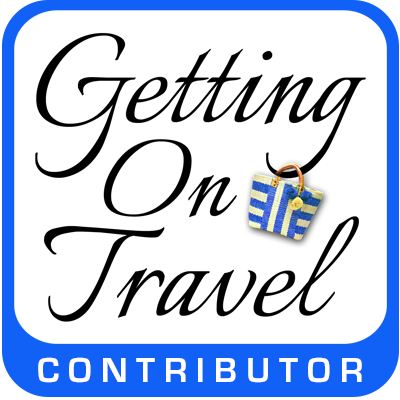 I have tried the Moroccan gold and although I zoomed through the culinary version I brought home from my trip, the cosmetic variety is my ‘go to’ for wild fly away hair once the winter dry air sets in. You captured some wonderful photos of the goats in the trees, and I loved brushing up on the history. Nice post Anita!